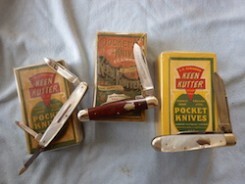 New York Knife was a company that made knives with the fancy scrolled aluminum bolsters.Not sure if there were others. Here's a box they originally came in. Lovely knife Joe ... indeed some beautiful bolsters too!!! Beautiful knife, Joe! Considering how nice that pearl and bolsters look, that knife must have been very pampered. Good point about the use of aluminium in that era KJ. I know it was too expensive to use for most stuff, but really I have no idea how it's value compared to silver, for example. Thanks. Is there a way to differentiate duralumin from aluminum ? Knowing which of these the bolsters on OP knife are might help to date it. Thank you Lyle and Josh and Roger and Dimitri and Lee and Mel. Neat old box, Dimitri. Thanks for showing that. peanut740 wrote: New York Knife was a company that made knives with the fancy scrolled aluminum bolsters.Not sure if there were others. Great looking pen knife, Ken. They put a heck of a nail nick on that main blade didn't they? Nice! Fantastic old knife, Joe!! Great box, Dimitri, that must be a rare one! Nice Ulster pen knife, Ken! FRJ wrote: Great looking pen knife, Ken.